There are only two reasons why most people replace Metal Fillings (called Amalgams). The most common reason is because the metal has broken down and is no longer a good restoration. The metal may have ragged edges that allow fluid to leak in around it causing further decay, it may be cracked and ready to break, it may have just worn out. If the tooth is to be preserved, the filling must be replaced. If it is quite large (more than one or two surfaces) the treatment of choice is often a crown. Click here to read more about crowns. The second most common reason metal fillings are replaced is cosmetic. Used by dentists for more than a century, dental amalgam is the most thoroughly researched and tested restorative material among all those in use. 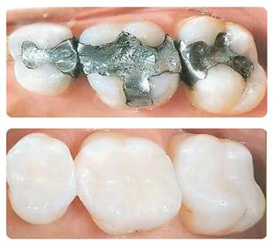 Amalgam is durable, easy to use, highly resistant to wear and relatively inexpensive in comparison to other materials. For those reasons, it remains a valued treatment option for dentists and their patients. 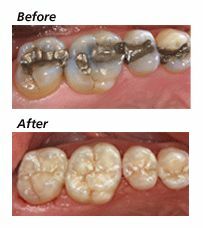 Dental amalgam is a stable alloy made by combining elemental mercury, silver, tin, copper and sometimes other metallic elements. Although dental amalgam continues to be a safe, commonly used restorative material, some concern has been raised because of its mercury content. However, the mercury in amalgam combines with other metals to render it stable and safe for use in filling teeth. While questions have arisen about the safety of dental amalgam relating to its mercury content, the major U.S. and international scientific and health bodies, including the National Institutes of Health, the U.S. Public Health Service, the Centers for Disease Control and Prevention, the Food and Drug Administration and the World Health Organization, among others are in agreement that dental amalgam is a safe, reliable and effective restorative material. Because amalgam fillings can withstand very high chewing loads, they are particularly useful for restoring molars in the back of the mouth where chewing load is greatest. They are also useful in areas where a cavity preparation is difficult to keep dry during the filling replacement, such as in deep fillings below the gum line. Amalgam fillings, like other filling materials, are considered biocompatible—they are well tolerated by most patients with only rare occurrences of allergic response. Disadvantages of amalgam include possible short-term sensitivity to hot or cold after the filling is placed. The silver-colored filling is not as natural looking as one that is tooth-colored, especially when the restoration is near the front of the mouth, and becomes visible when the patient laughs or speaks. And to prepare the tooth, the dentist may need to remove more tooth structure to accommodate an amalgam filling than for other types of fillings. Composite fillings are a mixture of glass or quartz filler in a resin medium that produces a tooth-colored filling. They are sometimes referred to as composites or filled resins. Composite fillings provide good durability and resistance to fracture in small-to-mid-size restorations that need to withstand moderate chewing pressure. Less tooth structure is removed when the dentist prepares the tooth, and this may result in a smaller filling than that of an amalgam. Composites can also be “bonded” or adhesively held in a cavity, often allowing the dentist to make a more conservative repair to the tooth. 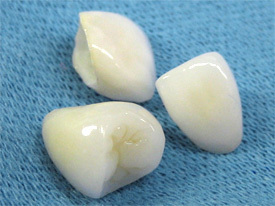 The cost is moderate and depends on the size of the filling and the technique used by the dentist to place the filling in the prepared tooth. It generally takes longer to place a composite filling than what is required for an amalgam filling. Composite fillings require a cavity that can be kept clean and dry during filling, and they are subject to stain and discoloration over time. Composites do tend to be prone to more sensitivity, discolor easily, and usually have to be replaced more frequently than metal fillings. However, due to their aesthetics and natural appearance they are becoming the treatment of choice for most people. Glass ionomers are primarily used in areas not subject to heavy chewing pressure. Because they have a low resistance to fracture, glass ionomers are mostly used in small non-load-bearing fillings (those between the teeth) or on the roots of teeth. Resin ionomers also are made from glass filler with acrylic acids and acrylic resin. They also are used for very small, non-load-bearing fillings (between the teeth), on the root surfaces of teeth, and they have low to moderate resistance to fracture.